Nestled within The Golden Kingdom at Six Flags Great Adventure, the Temple of the Tiger is a 33,000 square foot facility that our majestic Bengal tigers call home. The beautiful compound includes interactive exhibits and a state-of-the-art amphitheater featuring a 50 foot glass viewing tiger pool. Witness the love and devotion that TEAM TIGER has with these amazing animals as our team welcomes you with an up-close and personal look behind the amazing Bengal tiger. Sadly, the Temple of the Tiger has been permanently closed. 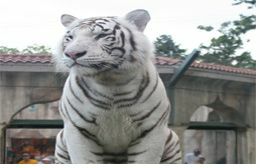 The tigers are no longer living in the habitat they occupied in the Golden Kingdom since 2005. No explanation has been forthcoming from park management.